Transmission electron micrograph of mesenchyme displaying the ultrastructure of a typical cell and matrix. Mesenchyme, in vertebrate embryology, is a type of connective tissue found mostly during the development of the embryo. It is composed mainly of ground substance with few cells or fibers. It can also refer to a group of mucoproteins found in certain types of cysts (etc. ), resembling mucus. It is most easily found as a component of Wharton's jelly. Embryology is the branch of biology that studies the prenatal development of gametes, fertilization, and development of embryos and fetuses. Additionally, embryology encompasses the study of congenital disorders that occur before birth, known as teratology. Ground substance is an amorphous gel-like substance in the extracellular space that contains all components of the extracellular matrix (ECM) except for fibrous materials such as collagen and elastin. Ground substance is active in the development, movement, and proliferation of tissues, as well as their metabolism. Additionally, cells use it for support, water storage, binding, and a medium for intercellular exchange. Ground substance provides lubrication for collagen fibers. The vitreous body is the clear gel that fills the space between the lens and the retina of the eyeball of humans and other vertebrates. It is often referred to as the vitreous humor or simply "the vitreous". Oscar Hertwig was a German zoologist and professor, who also wrote about the theory of evolution circa 1916, over 55 years after Charles Darwin's book The Origin of Species. He was the elder brother of zoologist-professor Richard Hertwig (1850–1937).The Hertwig brothers were the most eminent scholars of Ernst Haeckel from the University of Jena. They were independent of Haeckel's philosophical speculations but took his ideas in a positive way to widen their concepts in zoology. Initially, between 1879–1883, they performed embryological studies, especially on the theory of the coelom (1881), the fluid-filled body cavity. These problems were based on the phylogenetic theorems of Haeckel, i.e. the biogenic theory, and the "gastraea theory". Parenchyma is the bulk of a substance. In animals, a parenchyma comprises the functional parts of an organ and in plants parenchyma is the ground tissue of nonwoody structures. Mesenchyme is characterized morphologically by a prominent ground substance matrix containing a loose aggregate of reticular fibrils and unspecialized cells. Mesenchymal cells can migrate easily, in contrast to epithelial cells, which lack mobility and are organized into closely adherent sheets, and are polarized in an apical-basal orientation. In diploblasts (Cnidaria and Ctenophora), the mesenchyme is fully ectodermally derived. This kind of mesenchyme is called ectomesodermal, and is not considered true mesoderm. In triploblastic acoelomates (e.g., flatworms), the term parenchyme is sometimes used for the middle (mesenchymal) layer, in which the dense layer includes tissues derived from both ecto- and entomesoderm (true mesoderm, derived from entoderm). Ectoderm is one of the three primary germ layers in the very early embryo. The other two layers are the mesoderm and endoderm, with the ectoderm as the most exterior layer. It emerges and originates from the outer layer of germ cells. The word ectoderm comes from the Greek ektos meaning "outside", and derma, meaning "skin." Somitogenesis is the process by which somites form. Somites are bilaterally paired blocks of paraxial mesoderm that form along the anterior-posterior axis of the developing embryo in segmented animals. In vertebrates, somites give rise to skeletal muscle, cartilage, tendons, endothelium, and dermis. Organogenesis is the phase of embryonic development that starts at the end of gastrulation and continues until birth. 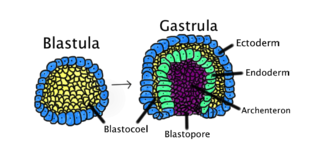 During organogenesis, the three germ layers formed from gastrulation: the ectoderm, endoderm, and mesoderm form the internal organs of the organism. The Wnt signaling pathways are a group of signal transduction pathways which begin with proteins that pass signals into a cell through cell surface receptors. Wnt is an acronym in the field of genetics that stands for 'Wingless/Integrated'. Catenins are a family of proteins found in complexes with cadherin cell adhesion molecules of animal cells. The first two catenins that were identified became known as α-catenin and β-catenin. A-catenin can bind to β-catenin and can also bind actin. B-catenin binds the cytoplasmic domain of some cadherins. Additional catenins such as γ-catenin and δ-catenin have been identified. The name "catenin" was originally selected because it was suspected that catenins might link cadherins to the cytoskeleton. The epithelial–mesenchymal transition (EMT) is a process by which epithelial cells lose their cell polarity and cell-cell adhesion, and gain migratory and invasive properties to become mesenchymal stem cells; these are multipotent stromal cells that can differentiate into a variety of cell types. EMT is essential for numerous developmental processes including mesoderm formation and neural tube formation. EMT has also been shown to occur in wound healing, in organ fibrosis and in the initiation of metastasis in cancer progression. Mesoglea refers to the tissue found in jellyfish that functions as a hydro-static skeleton. Mesohyl generally refers to tissue found in sponges. Paraxial mesoderm, also known as presomitic or somitic mesoderm is the area of mesoderm in the neurulating embryo that flanks and forms simultaneously with the neural tube. The cells of this region give rise to somites, blocks of tissue running along both sides of the neural tube, which form muscle and the tissues of the back, including connective tissue and the dermis. Eye formation in the human embryo begins at approximately three weeks into embryonic development and continues through the tenth week. 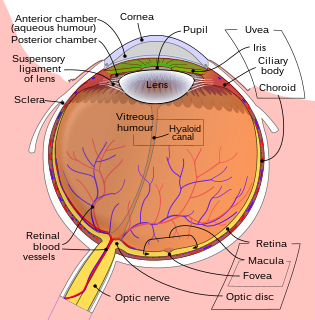 Cells from both the mesodermal and the ectodermal tissues contribute to the formation of the eye. Specifically, the eye is derived from the neuroepithelium, surface ectoderm, and the extracellular mesenchyme which consists of both the neural crest and mesoderm. The limb bud is a structure formed early in vertebrate limb development. As a result of interactions between the ectoderm and underlying mesoderm, formation occurs roughly around the fourth week of development The upper limb bud appears in the third week of human development and the lower limb bud appears four days later. Zinc finger protein SNAI1 is a protein that in humans is encoded by the SNAI1 gene. Snail is a family of transcription factors that promote the repression of the adhesion molecule E-cadherin to regulate epithelial to mesenchymal transition (EMT) during embryonic development. Cadherin-1 also known as CAM 120/80 or epithelial cadherin (E-cadherin) or uvomorulin is a protein that in humans is encoded by the CDH1 gene. CDH1 has also been designated as CD324. It is a tumor suppressor gene. A mesenchymal–epithelial transition (MET) is a reversible biological process that involves the transition from motile, multipolar or spindle-shaped mesenchymal cells to planar arrays of polarized cells called epithelia. MET is the reverse process of epithelial–mesenchymal transition (EMT). Unlike epithelial cells – which are stationary and characterized by an apical-basal polarity, tight junctions, and expression of cell-cell adhesion markers such as E-cadherin, mesenchymal cells do not make mature cell-cell contacts, can invade through the extracellular matrix, and express markers such as vimentin, fibronectin, N-cadherin, Twist, and Snail. METs occur in normal development, cancer metastasis, and induced pluripotent stem cell reprogramming. Ingression is one of the many changes in the location or relative position of cells that takes place during the gastrulation stage of animal development. It produces an animal's mesenchyme cells at the onset of gastrulation. During the epithelial-mesenchymal transition (EMT), the primary mesenchyme cells (PMCs) detach from the epithelium and become internalized mesenchyme cells that can migrate freely. Each animal system utilizes an EMT to produce mesenchyme cells. Neural crest cells are a group of temporary, multipotent cells that are pinched off during the formation of the neural tube and therefore are found at the dorsal (top) region of the neural tube during development. They are derived from the ectoderm germ layer, but are sometimes called the fourth germ layer because they are so important and give rise to so many other types of cells. They migrate throughout the body and create a large number of differentiated cells such as neurons, glial cells, pigment-containing cells in skin, skeletal tissue cells in the head, and many more. The clock and wavefront model is a model used to describe the process of somitogenesis in vertebrates. Somitogenesis is the process by which somites, blocks of mesoderm that give rise to a variety of connective tissues, are formed. ↑ "Blue Histology - Connective Tissues" . Retrieved 2008-12-05. ↑ Singh, Inderbir (April 15, 2007). Textbook of Human Histology With Colour Atlas. Jaypee Brothers Medical Publishers. [ page needed ]. ISBN 978-81-7179-967-1. 1 2 Collins, P.; Billett, F. S. (1995). "The terminology of early development: History, concepts, and current usage". Clinical Anatomy. 8 (6): 418–425. doi:10.1002/ca.980080610. PMID 8713164. 1 2 3 4 5 6 Brusca, R.C. ; Brusca, G.J. (2003). Invertebrates (2nd ed.). Sunderland, Massachusetts. p. 220. ↑ Kierszenbaum, Abraham L.; Tres, Laura (2015). Histology and Cell Biology: An Introduction to Pathology E-Book (4 ed.). Elsevier Health Sciences. p. 123. ISBN 9780323313353. ↑ Strum, Judy M.; Gartner, Leslie P.; Hiatt, James L. (2007). Cell biology and histology. Hagerstown, MD: Lippincott Williams & Wilkins. p. 83. ISBN 978-0-7817-8577-8. ↑ Sadler, T.W. (2006). Langman's Medical Embryology. Lippincott Williams & Wilkins. pp. 68–70. ISBN 978-0-7817-9485-5. 1 2 Kalluri, Raghu; Weinberg, Robert A. (2009). "The basics of epithelial-mesenchymal transition". Journal of Clinical Investigation. 119 (6): 1420–8. doi:10.1172/JCI39104. PMC 2689101 . PMID 19487818. ↑ Okada, H; Danoff, T. M.; Kalluri, R; Neilson, E. G. (1997). "Early role of Fsp1 in epithelial-mesenchymal transformation". The American Journal of Physiology. 273 (4 Pt 2): F563–74. PMID 9362334. ↑ Eger, A; Stockinger, A; Schaffhauser, B; Beug, H; Foisner, R (2000). "Epithelial mesenchymal transition by c-Fos estrogen receptor activation involves nuclear translocation of beta-catenin and upregulation of beta-catenin/lymphoid enhancer binding factor-1 transcriptional activity". The Journal of Cell Biology. 148 (1): 173–88. doi:10.1083/jcb.148.1.173. PMC 3207144 . PMID 10629227. ↑ Mohamed, O. A.; Clarke, H. J.; Dufort, D (2004). "Beta-catenin signaling marks the prospective site of primitive streak formation in the mouse embryo". Developmental Dynamics. 231 (2): 416–24. doi:10.1002/dvdy.20135. PMID 15366019. ↑ Thiery, J. P.; Sleeman, J. P. (2006). "Complex networks orchestrate epithelial-mesenchymal transitions". Nature Reviews Molecular Cell Biology. 7 (2): 131–42. doi:10.1038/nrm1835. PMID 16493418. ↑ Yamakoshi, S; Bai, R; Chaen, T; Ideta, A; Aoyagi, Y; Sakurai, T; Konno, T; Imakawa, K (2012). "Expression of mesenchymal-related genes by the bovine trophectoderm following conceptus attachment to the endometrial epithelium". Reproduction (Cambridge, England). 143 (3): 377–87. doi:10.1530/REP-11-0364. PMID 22157247. ↑ Bellairs, R (1986). "The primitive streak". Anatomy and Embryology. 174 (1): 1–14. doi:10.1007/bf00318331. PMID 3518538. ↑ Hay, E. D. (2005). "The mesenchymal cell, its role in the embryo, and the remarkable signaling mechanisms that create it". Developmental Dynamics. 233 (3): 706–20. doi:10.1002/dvdy.20345. PMID 15937929. ↑ Mareschi, K; Novara, M; Rustichelli, D; Ferrero, I; Guido, D; Carbone, E; Medico, E; Madon, E; Vercelli, A; Fagioli, F (2006). "Neural differentiation of human mesenchymal stem cells: Evidence for expression of neural markers and eag K+ channel types". Experimental Hematology. 34 (11): 1563–72. doi:10.1016/j.exphem.2006.06.020. PMID 17046576. ↑ Schmidt, C; Stoeckelhuber, M; McKinnell, I; Putz, R; Christ, B; Patel, K (2004). "Wnt 6 regulates the epithelialisation process of the segmental plate mesoderm leading to somite formation". Developmental Biology. 271 (1): 198–209. doi:10.1016/j.ydbio.2004.03.016. PMID 15196961. ↑ Stockdale, F. E.; Nikovits Jr, W; Christ, B (2000). "Molecular and cellular biology of avian somite development". Developmental Dynamics. 219 (3): 304–21. doi:10.1002/1097-0177(2000)9999:9999<::AID-DVDY1057>3.0.CO;2-5. PMID 11066088. ↑ Bronner-Fraser, M (1994). "Neural crest cell formation and migration in the developing embryo". FASEB Journal : Official Publication of the Federation of American Societies for Experimental Biology. 8 (10): 699–706. doi:10.1096/fasebj.8.10.8050668. PMID 8050668. ↑ Trainor, P. A. (2005). "Specification of neural crest cell formation and migration in mouse embryos". Seminars in Cell & Developmental Biology. 16 (6): 683–93. doi:10.1016/j.semcdb.2005.06.007. PMID 16043371. ↑ Brusca, R.C. ; Brusca, G.J. (2003). Invertebrates (2nd ed.). Sunderland, Massachusetts. p. 101. Look up mesenchyme in Wiktionary, the free dictionary.